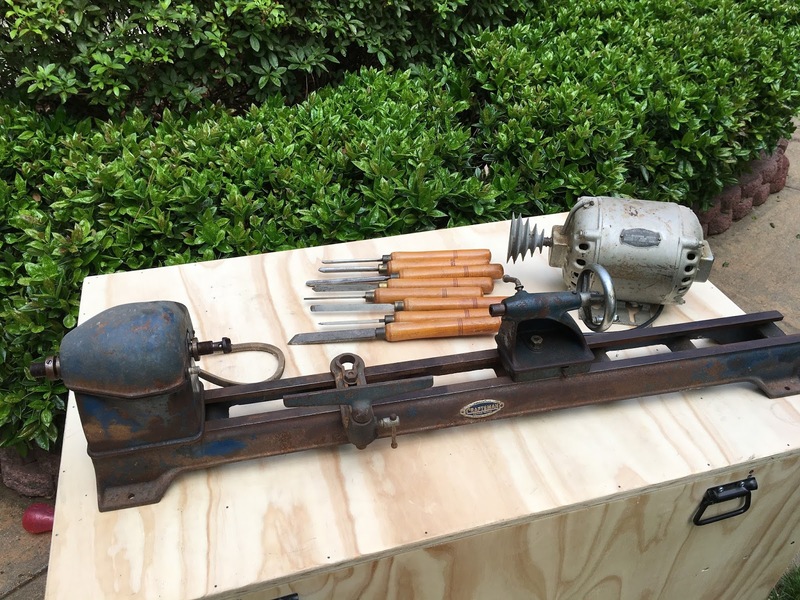 When I saw an ad on Craigslist for this lathe I knew immediately it was the one for me. 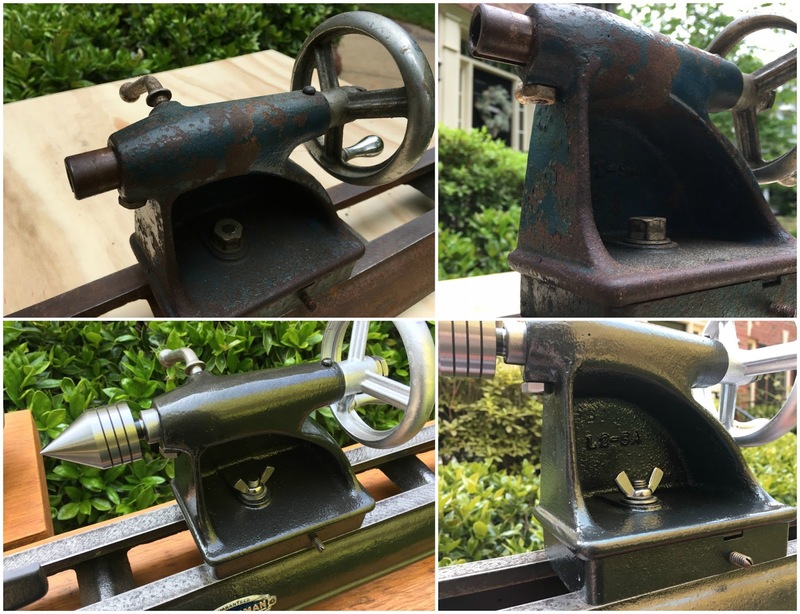 It was a good price but I knew it would need a restoration (and sturdy table built). It took me a few weeks to complete everything and I’m so excited it’s finished so I can stop thinking (and dreaming) about it. 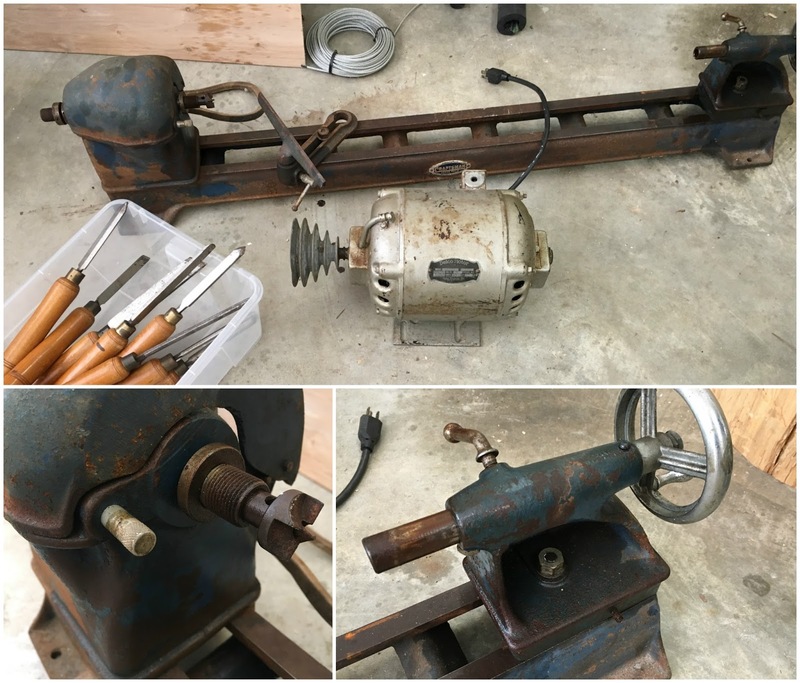 Everything was in great condition (besides the obvious cosmetic issues) and the only thing missing was the tailstock center. 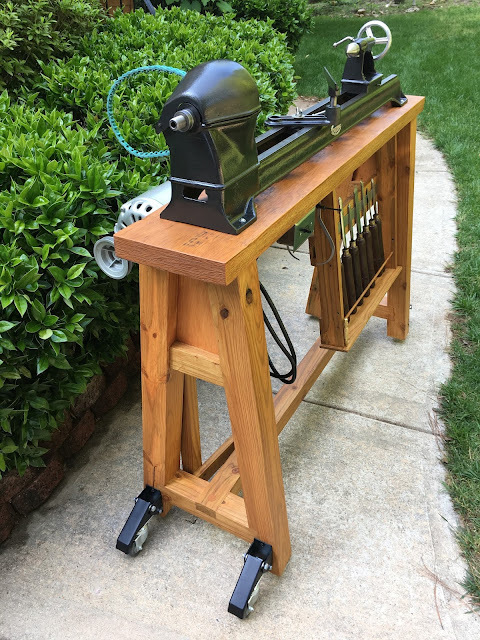 I kept everything original on the lathe except for buying a live center, new v-belt and adding wing nuts to the tool rest and tailstock for easier adjustments. BEFORE and AFTER pictures are my favorite! Let me share some with you! The turning tools also got a makeover, including new sharp edges (free-handing isn’t ideal but I did my best)! 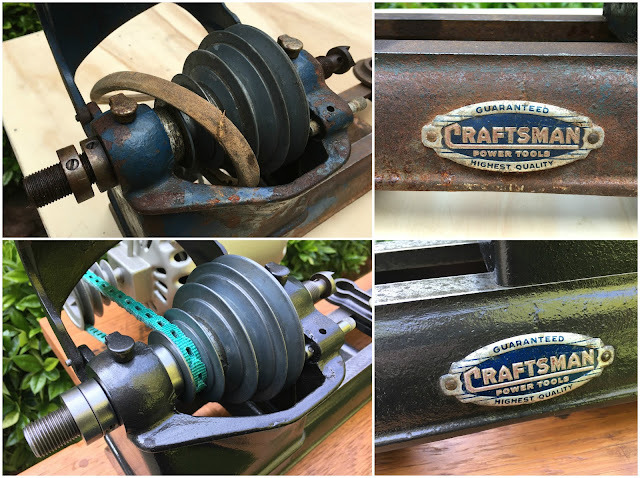 The restoration process was just the same as other tools I’ve worked on requiring a lot of sanding, grinding, paint removal, scrubbing, prepping for paint, painting, cleaning, oiling, etc. 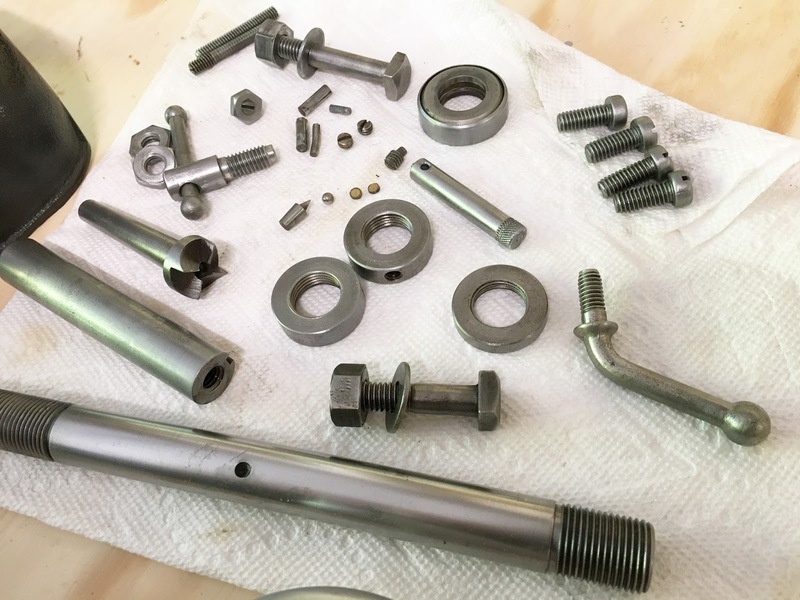 Because lathes are very simple machines it was very straightforward to disassemble (thankfully). I stripped the paint off the body castings, scrubbed and power washed everything and dried all the pieces super well. 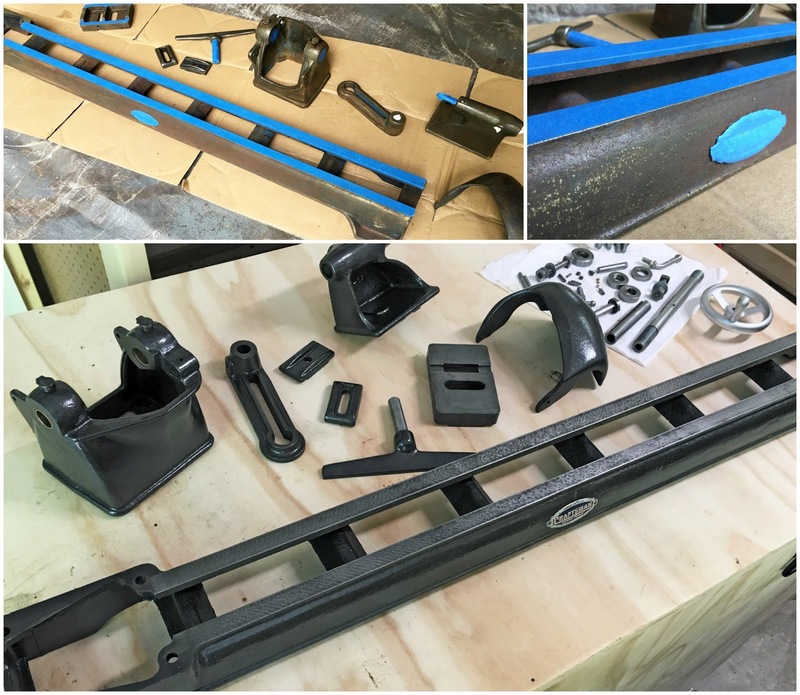 Masked all the ‘bare metal’ edges and primed+painted. I used my bench grinder with a fine wire wheel to remove all the rust from the smaller parts. See the difference!? I enjoy the quick results using the grinder! All my small parts are rust free and ready to go! 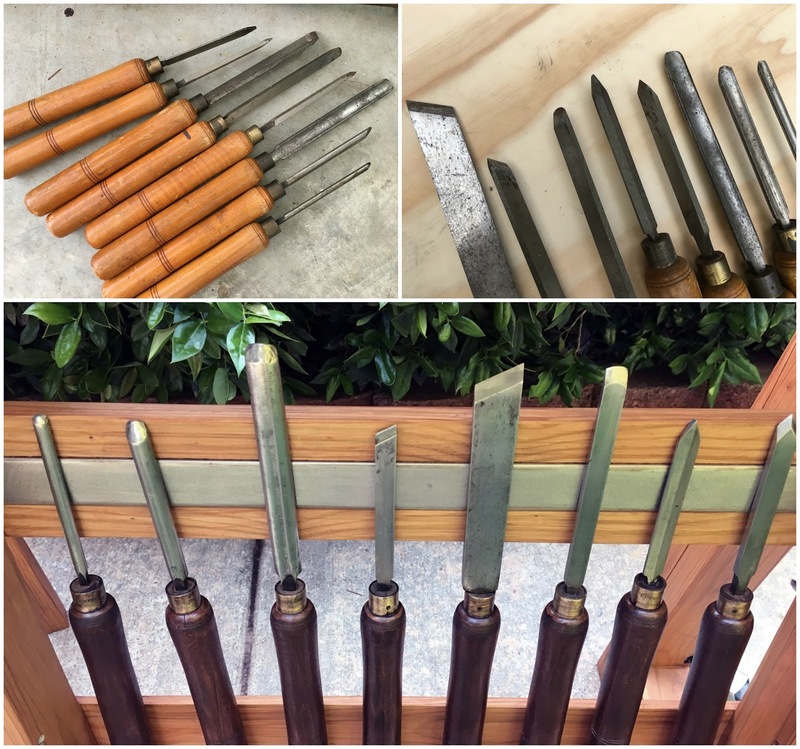 I sanded the smooth metal areas with 800 grit paper and rubbed everything down with WD-40. While I waited for the paint on the lathe to cure I worked on building the table. 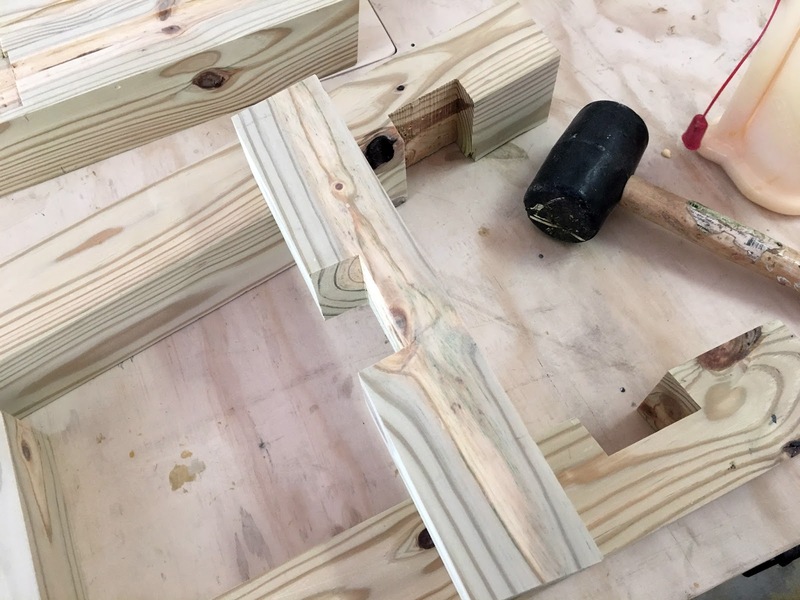 I had a few 4×4 posts I squared up and machined into smaller posts for the legs. I kept the cut off strips to make the motor stand and hand tool holder. 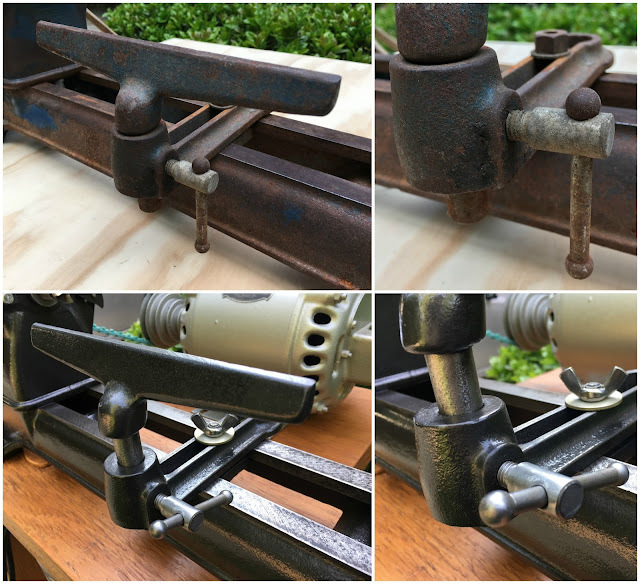 I also had a construction beam that I used for the table top. 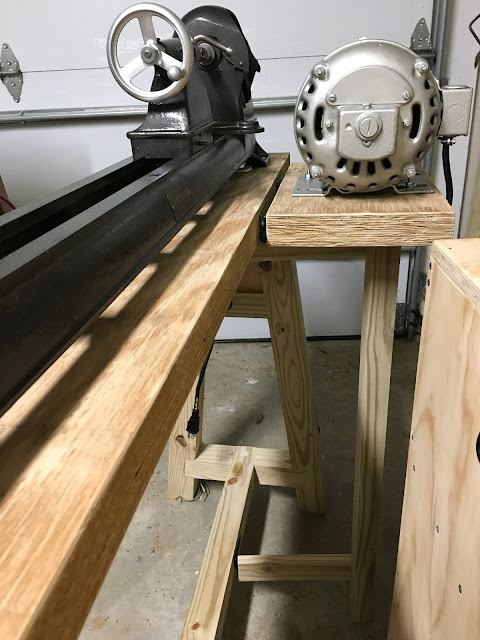 After realizing I wouldn’t be able to mount the motor underneath the table like I originally planned/designed the table for I had to brainstorm how to mount the motor behind the lathe. In the end it all worked out. 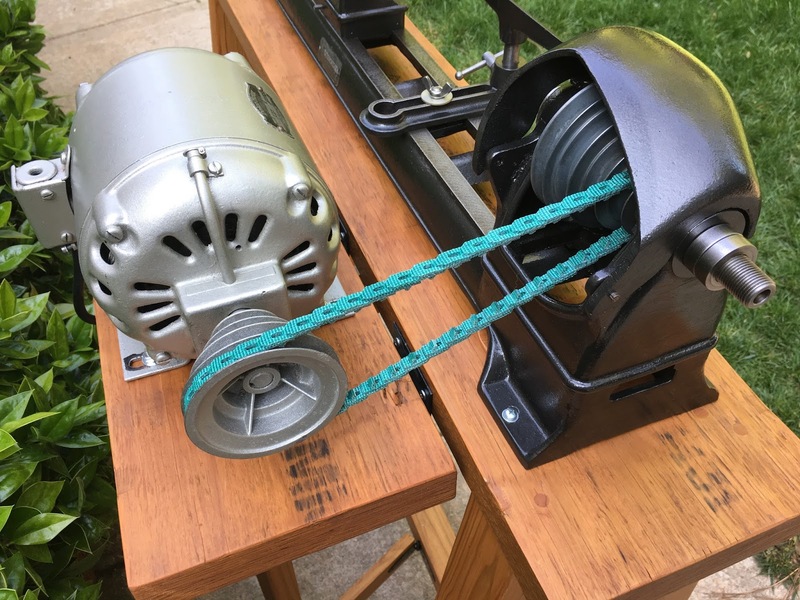 Because the motor is on hinges it can be lifted up for changing the belt on the pulleys and also lowered by pushing the ‘motor stand’ out of the way (also on hinges). The only thing I’m not happy about regarding this design is that because the motor is so heavy the table is tipsy when engaging the caster wheels (and while moving the table). 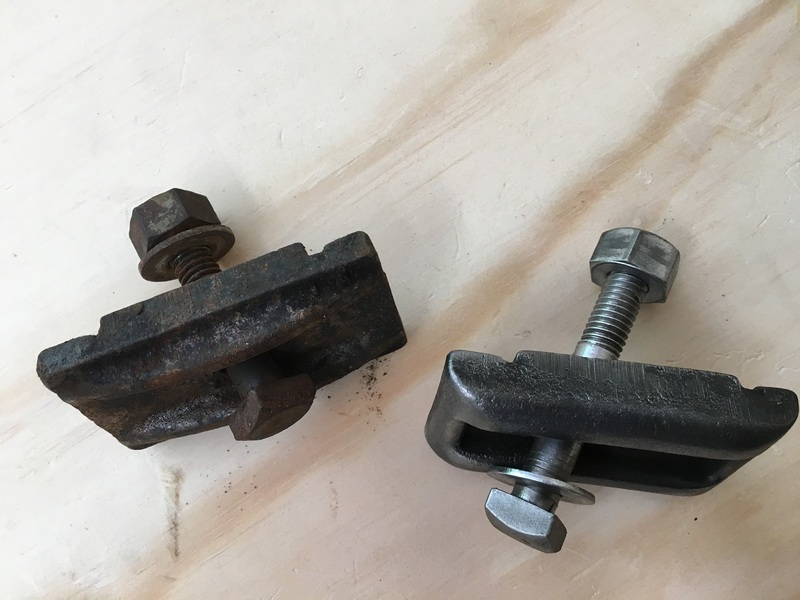 It’s not tipsy when the casters aren’t being used, in fact, it’s surprisingly solid even with the motor on hinges (I was worried about vibration – but nope!). 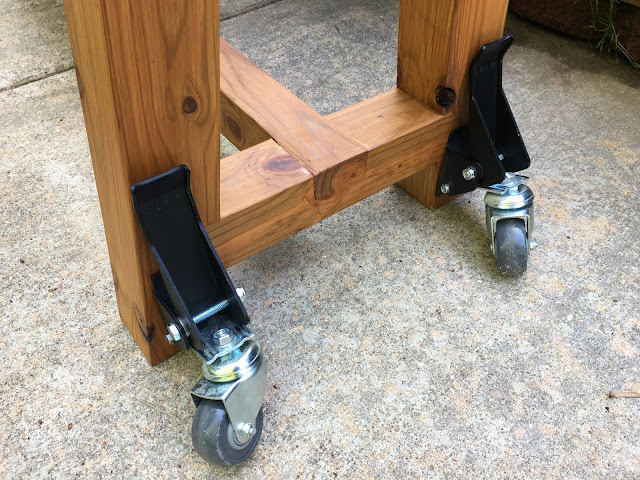 As a side note: I got the “workbench” casters from Rockler. For being $59 I would have hoped they’d be easier to engage/disengage. It’s pretty awkward because you want to engage/disengage both on the same side together and that means you’re using your hands to be able to do that OR you have to pull up on the table while using your foot to do one at a time. When disengaging them, they don’t always drop the table completely and you have to move it back/forth for the casters to fold over to one side to drop the table fully. Also, when going over the lines in concrete they tend to get stuck – if you pull up on your table to get it un-stuck the caster(s) lower further and fold down underneath your table leg (ugh)! They’re sturdy casters and will last but they’re exceptionally frusterating to operate. 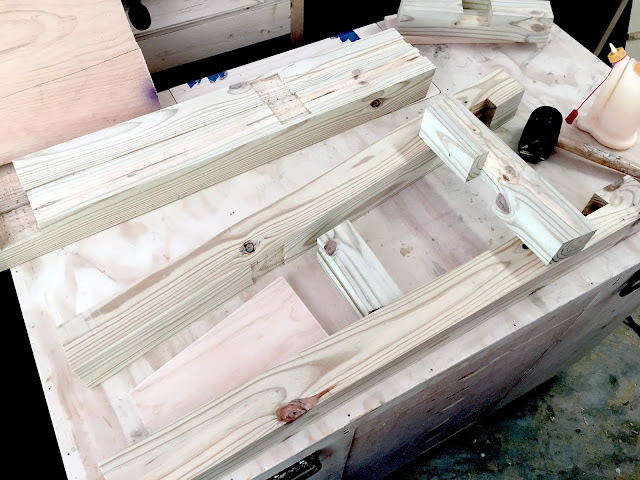 Leg pieces ready to be assembled! I made a rabbit for the small panel piece to slide into. 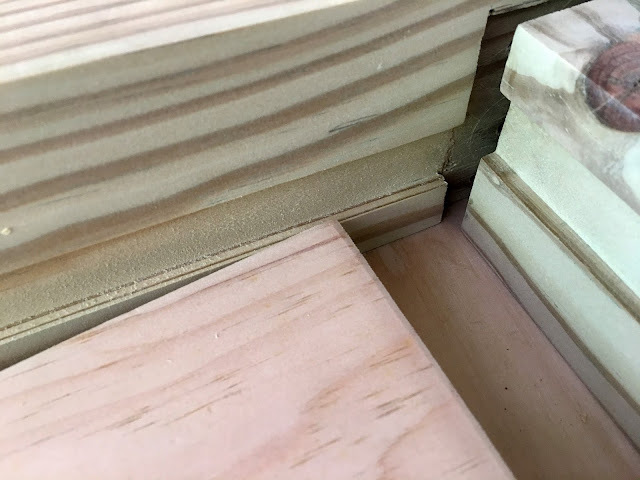 Once the legs were glued I attached the brace that runs between with a lap joint + dowel, then glued + screwed the top on. 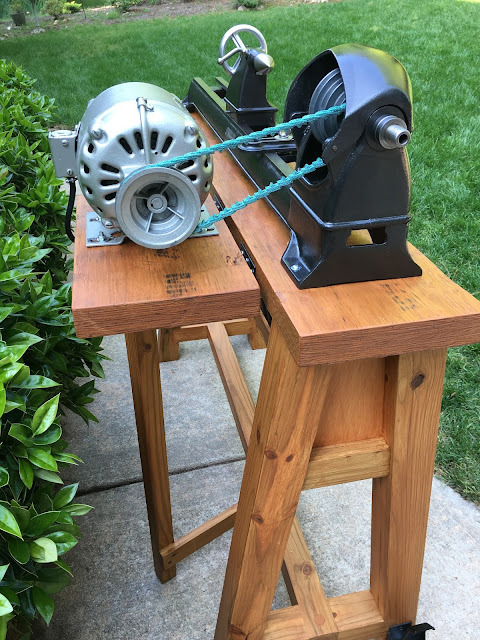 Next I made the stand for the motor to sit on. 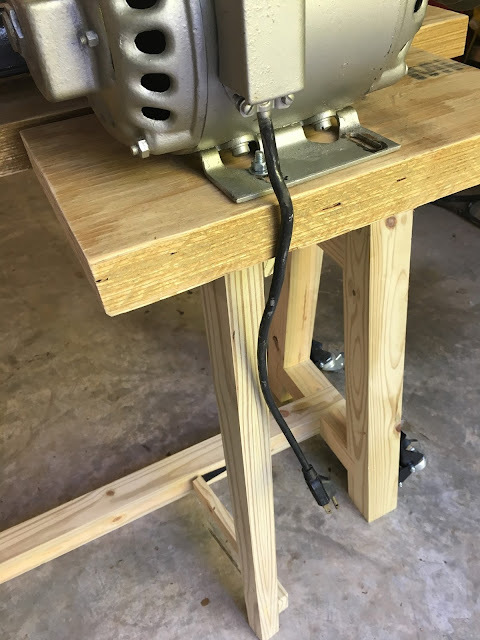 With the table built I was able to mount the motor and work on re-wiring + adding a switch! I don’t like the idea of plugging a tool in to turn it on. Adding a switch is VERY easy! 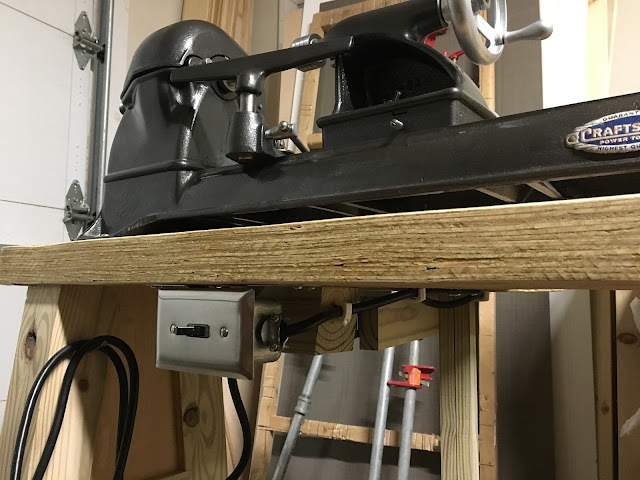 Because I already made a post with details on how to add a switch to a motor I won’t give too many details here – but I did want to show the few differences (mostly mounting). These are all the supplies I used. 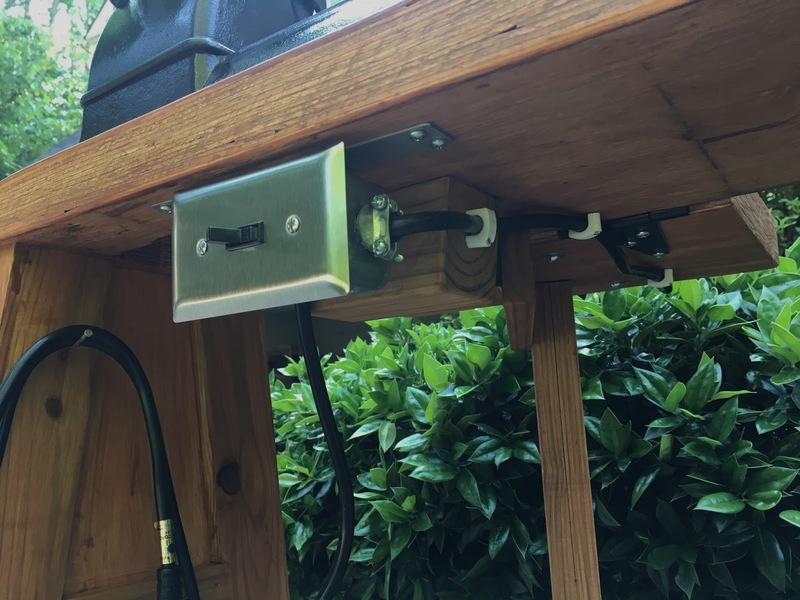 I was so happy to find an electrical box that would be easy to mount underneath the table! 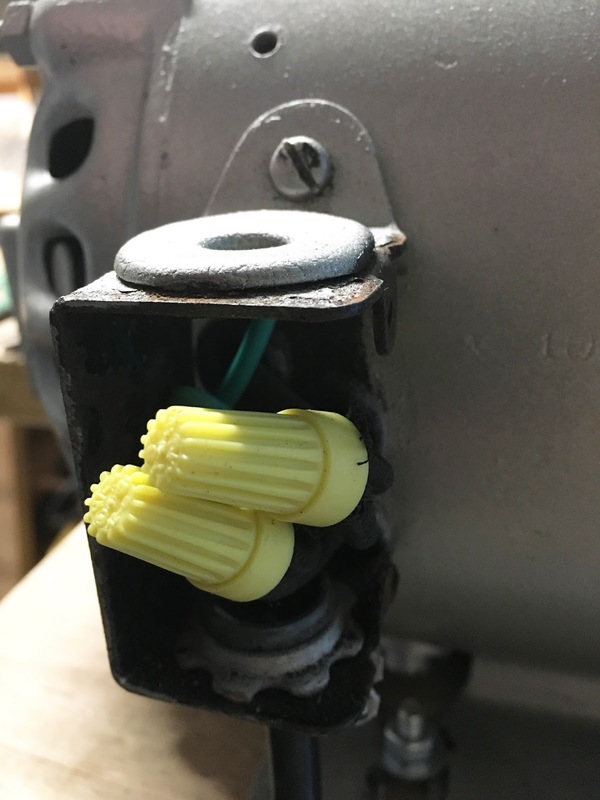 A few other differences from my previous post: I didn’t buy an extra piece of black cord to go from motor to switch and just cut a section from the replacement cord I was using. 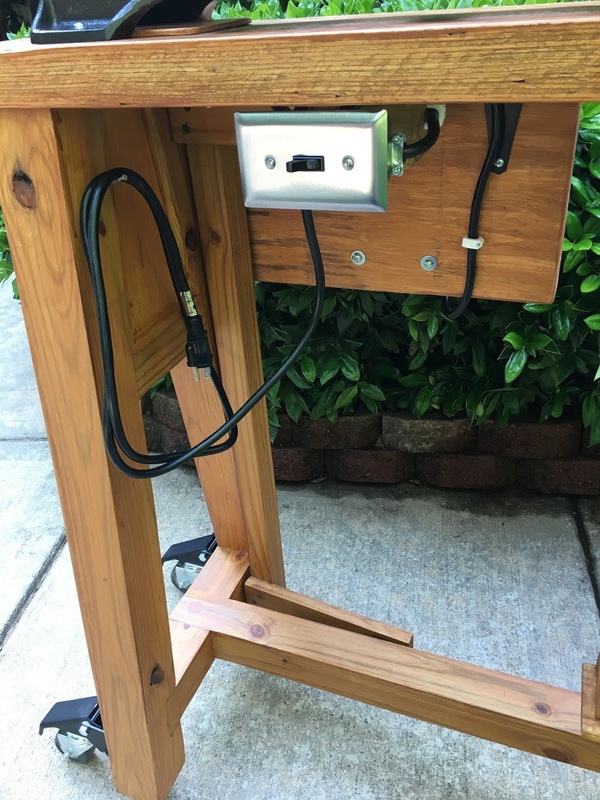 I also used clips with nails for securing cord underneath the table. 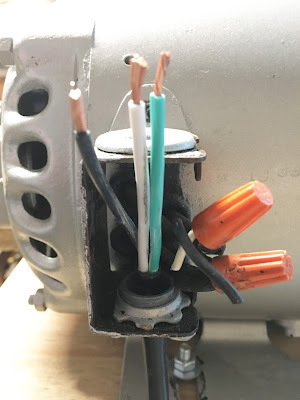 I threaded the end of my new cord through the wire casing on motor. I grounded the green underneath the screw on the wire casing and used wire nuts to secure new wires with motor wires. Next I screwed my electrical box where I wanted it and cut the cord so it would go through the box with a few inches extra. From there I connected both ends of the wires through the box/switch. Next I attached the plastic clips to hold the wire under table. 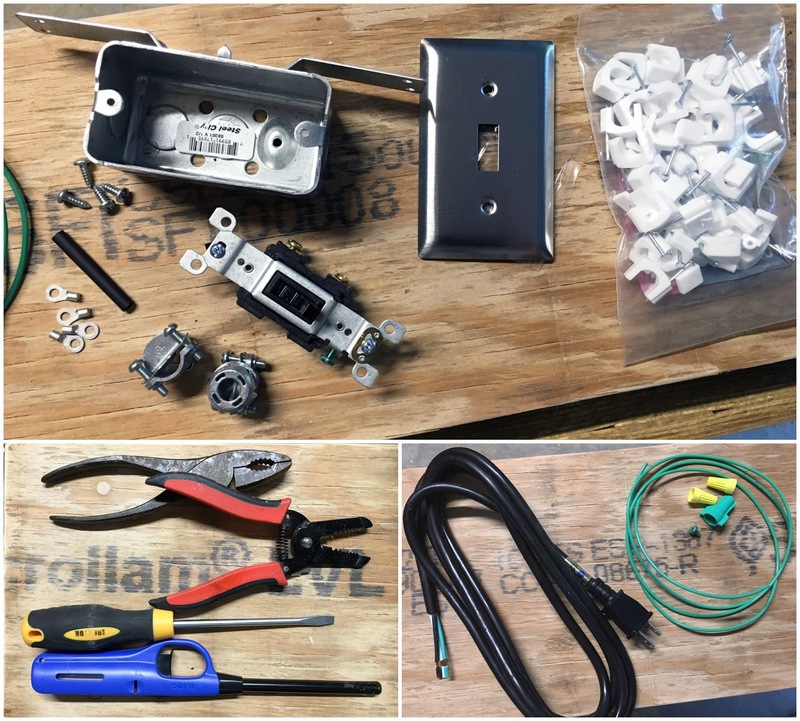 It’s super easy and inexpensive to add a switch like this! It feels good knowing my tool is grounded and safe to use + easier to turn on/off. *DISCLAIMER* please use safety, caution and common sense when working with electrical. I will not be held responsible for any mishaps with electrical. Double check with an electrician to ensure the wiring for your particular motor and set-up is done correctly and to code. After the wiring I was pretty much waiting on the v-belt to arrive in the mail. That’s when I decided I really SHOULD disassemble everything, sand it better so I could stain the wood to make it nicer (green-treated wood isn’t very pleasing). Before disassembling everything I thought I should figure out something for my turning tools. I had an old kitchen knife strip magnet in the garage and incorporated it into the design. I wanted something simple that was easy to hang from the table. 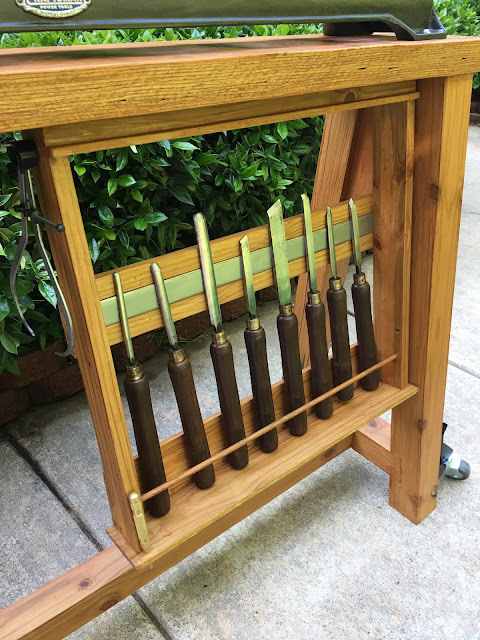 I used a few hinges and it hangs with a nice angle on its own. I used Flood outdoor stain and rubbed wax on the top to give a smooth finish. 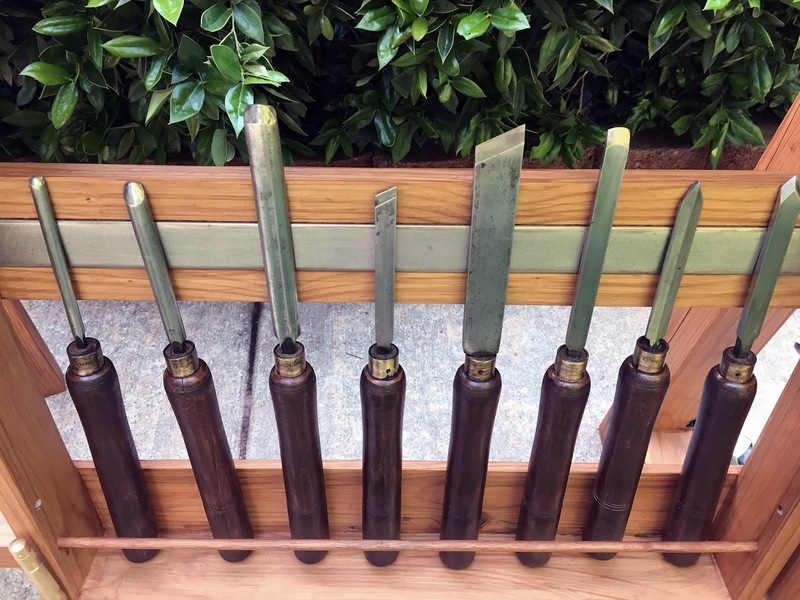 While reassembling I wiped all the bare-metal finishes with WD-40 again and used Zoom Turbine oil for the oil pots in the headstock (oilite bushings) and motor. All I can say is "WOW". Beautiful job for a beautiful lady!!! Wow this is such an amazing project! 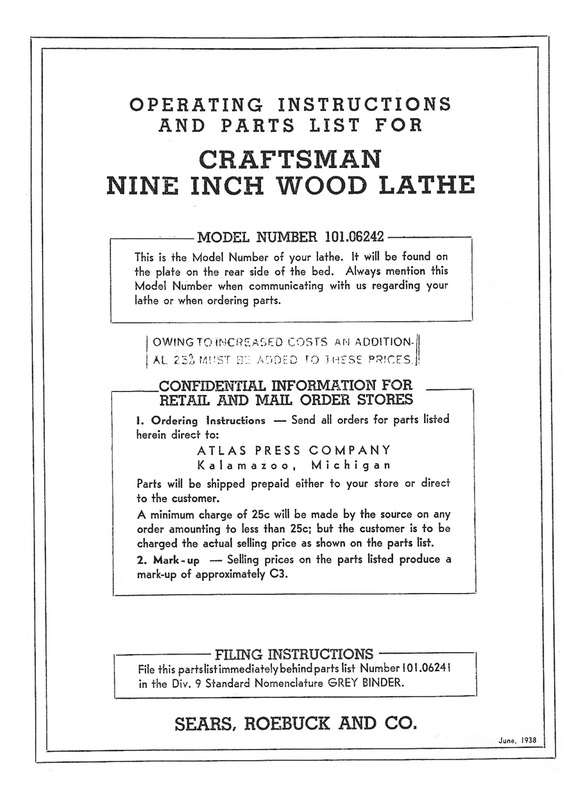 I found you through the vintagemachinery.org site while looking for Craftsman wood lathes, I'm inheriting one very similar to yours from my dad and this post is so inspiring. Like yours I'm also missing the live center and also the back fly wheel is broken – would you mind sharing where you found the replacement center? Thank you! This little lathe was a really easy restoration because it really is so simple. The results come quickly because it is so simple – I wish you luck! As for the center – I believe the original would have been a dead center which you wouldn't want anyways. 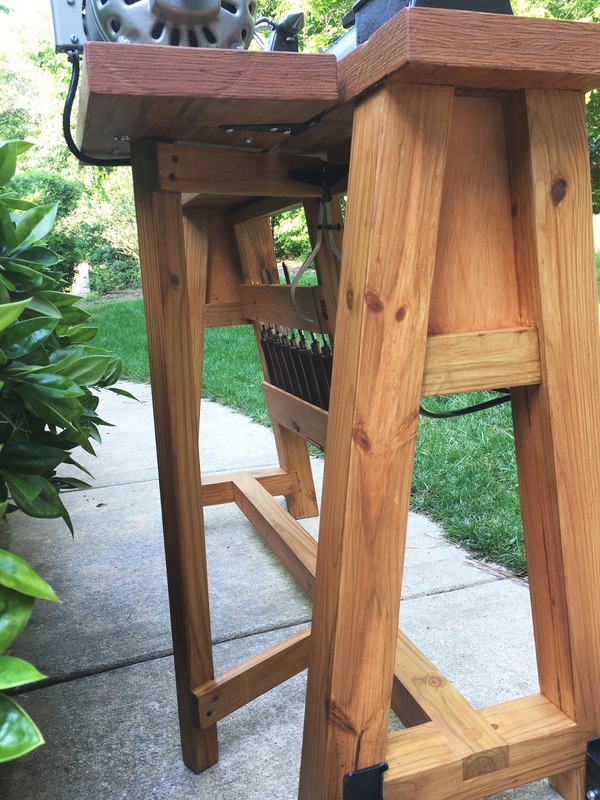 You'll want a live center, meaning it spins with your wood. I got mine for $25 on Amazon. Any 1MT center would do but I was happy with the price and quality! You're welcome to e-mail me anytime with questions! Nice job! I have the same lathe but have not started on a bench for it. 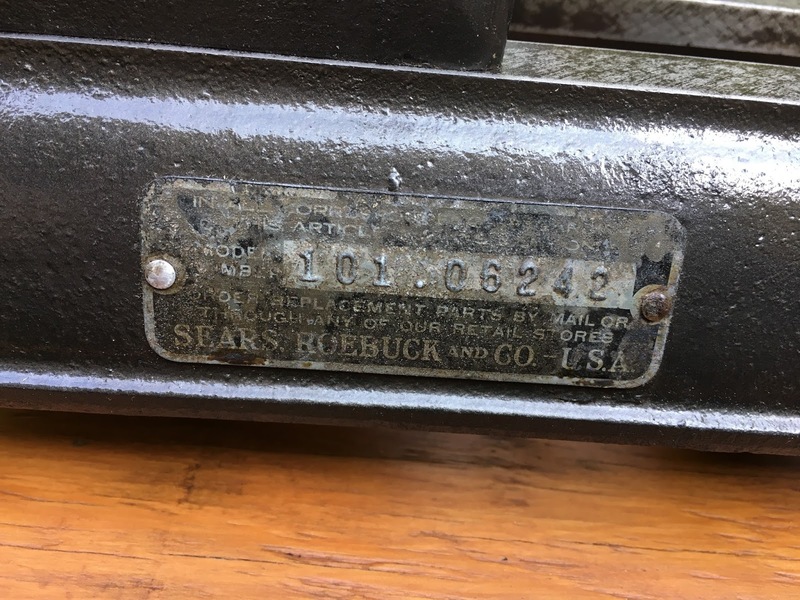 I was looking at it closely tonight and concluded I probably could drive the headstock with the motor below. It seemed tight for belt clearance but not impossible. 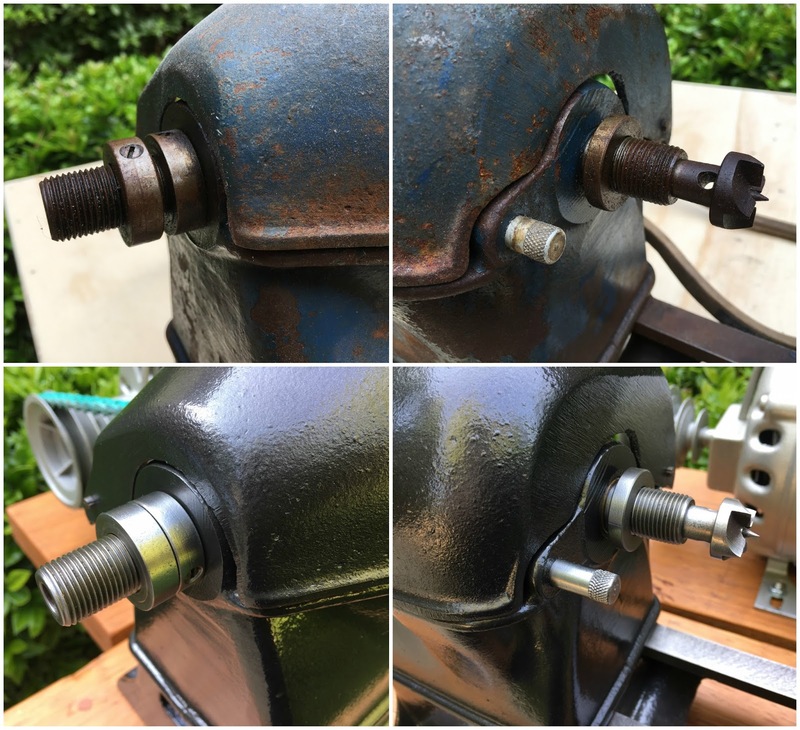 I felt I could improve clearance if needed by grinding / filing the lower opening a bit. Then I read here that you tried it. You concluded it was not possible. Why did you come to that conclusion? Trial and error? Hi James! Yes, I definitely tried it out and was bummed that it didn’t work. 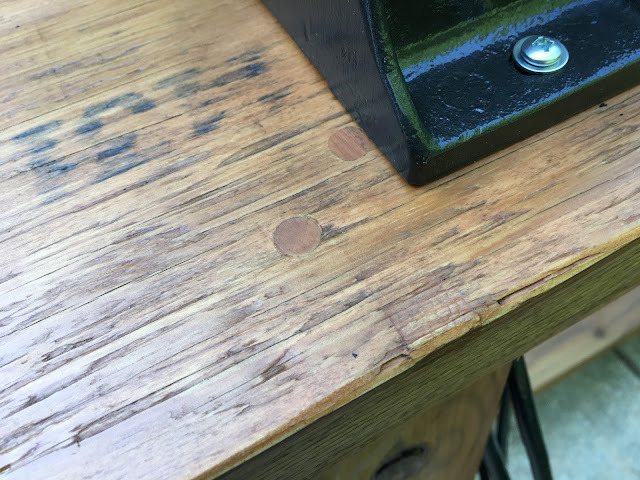 I cut a hole in my table underneath the headstock pulleys only to discover that the belt rubbed on the casing of the headstock REALLY bad. It ended up being a good thing because having the motor on the back with hinges made changignthe belt super easy.. just had to lift and change the belt. 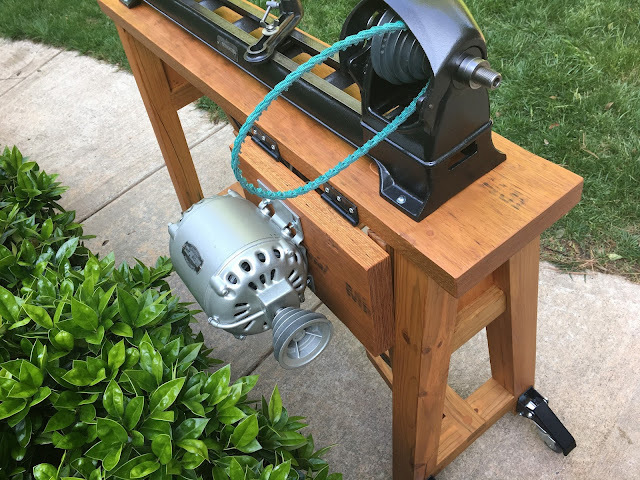 I had the length of belt just right so the weight of the motor have it just the right amount of tension. 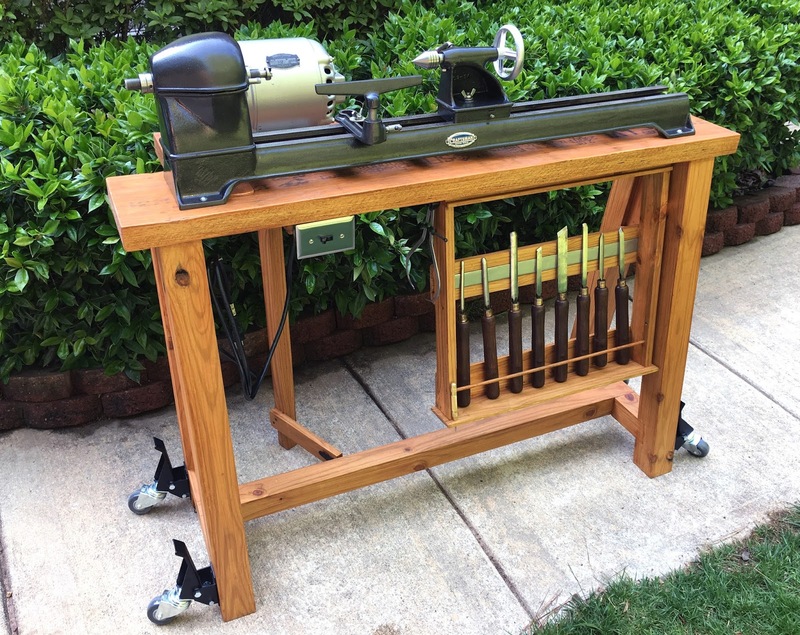 I have one of these lathes that I have carried around for 40 years. 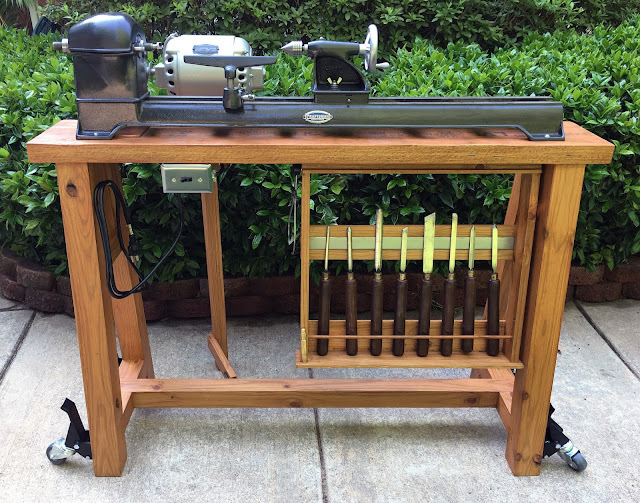 I just recently cleaned it up and started turning. I would like to get a chuck for bowls but cannot find an adapter. 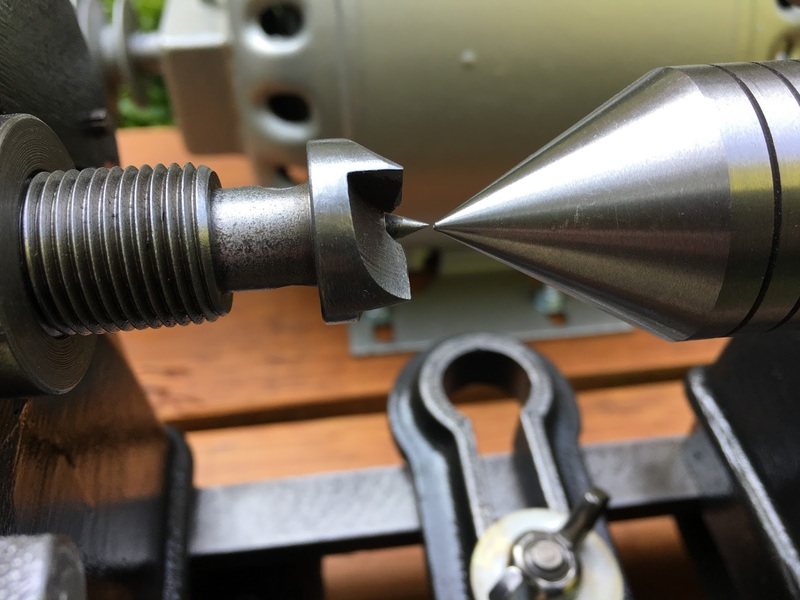 I believe the spindle is 3/4” x 18 tip. Do you know where one might get an adapter? Hi Dave! Are you sure it’s 3/4″? That seems quite small. 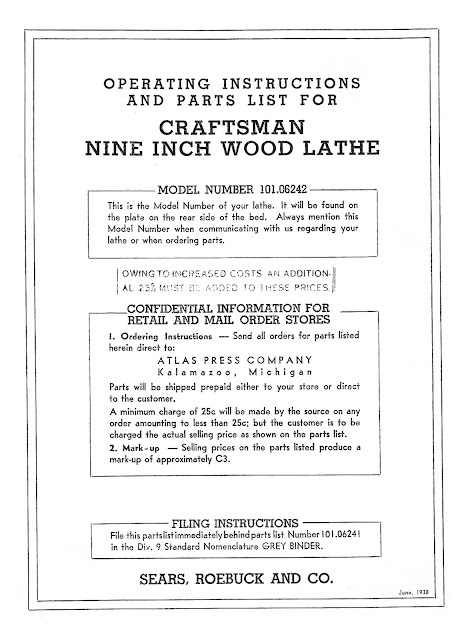 I’d look at Craft Supplies USA, Penn State and Woodworkers Emporium first.